100' Oceanfront or see My other Oceanfront 478800. Free 8th Day at Christmas! To book more than 51 weeks out you must inquire with owner. Cancellation policy for resort rentals is >90 days lose 7%, >45 days for half. At 45 days, no refund. Sandpiper’s Nook RentThisGem: The $1,000,000 completion in 2015 of the addition & renovations to this 100-foot oceanfront home in has turned it into a vacation paradise: a 1000 foot addition in 2010, large hurricane windows in 2011, new laundry and pantries in ’12 and upgraded kitchen to double ovens in ‘13, new doors and expanded view windows in the living area in 2015...we added an elevator & many other features. It has the largest pool in the area (17’ x 44’), a deepened spa & the new ‘SeaScape’ outdoor living room sits poolside under the deck/house for a shaded area with couch/chairs/bar and fridge. Wake up to the sunrise over the ocean from all bedrooms, enjoy the dolphins from the elevated deck, use the private access to the beach, and enjoy unforgettable views. Every room except the bathrooms face the ocean – & the ocean is right outside the windows. This executive home’s main level is 22’ above sea level with 4 of 6 bedrooms at 30’ & thus spectacular views from every room. Every one of the 6 bedrooms has an ocean view & has been newly remodeled. Whether you choose the Nautical or Nautilus Room, the SeaShell, the Coral, Reef, or the Sand Dollar, you will enjoy premium beds, linens & amenities. We’ve worked to fulfill your every desire: from wine fridge to poolside fridge to ice maker to DVR, DVDs, large plasma TVs, high speed wireless & high end cable, electronic charging stations, state-of-art appliances and electronics, stereo at pool, video library, book library, restaurant guide, fenced sandbox, pool & beach toys and places to read & relax in every room. This is what the perfect vacation home should be. Bedrooms: All six Bedrooms have Ocean views, large plasma TVs/DVD players & ceiling fans. There are two master suites (Seashells on main floor & Nautilus on the top floor). Each has 1 king, a large bath, tub, shower, walk-in closets & spectacular ocean views. . The Sand Dollar Room has 2 queens, bath with divided commode, large shower with skylight & a spectacular ocean view. The Reef Room has a queen + twin with trundle, large shower, walk in closet & spectacular ocean view. The recent addition includes the Nautical room which has 1 king, a tri-bunk & a bunk bed (5 twins total), a desk top/work area, a bath with tub/shower & separate room with 2 sinks, walk in closet, charging station for electronics & ocean view. The new Coral room has 2 kings; shower with 2 seats, double sinks, charging station for electronics & ocean view. All bedrooms have private baths. (Floor plans with bed layout available). Bathrooms feature comfort height toilets with soft close lids, in the new addition: heaters in the ceiling along with nightlights & fans, & an Instant Hot water system so you won’t run short. The pool is huge (& in the sun all day), the deepened hot tub seats 8-11 people & both have ocean view. Under the house & deck is the SeaScape living room, a covered travertine lanai with two seating areas, fans & lights: an area for shade lovers who want to sit near the pool with bar/fridge. The private, fenced ocean front yard is very large (100 feet wide), with private beach access & a large lawn for badminton, croquet or bocce & a poolside patio; there is a gated deck on the back of the house, a gated sandbox area, & private beach access. There is an outdoor foot & full shower. There is a fenced sandbox area to contain toddlers, & a gate to keep them on the deck. Lots of patio furniture & umbrellas. The custom gourmet kitchen features granite countertops, a Thermidor gas stovetop, Ge dishwasher, large capacity Whirlpool fridge, double ovens & other high-end appliances including an ice machine & wine cooler. There is a kitchen eating area, bar eating area & large dining room, all on the ocean. There is an elevator for arrival & departure day ( available week long if you have a need), a first & second floor laundry (Whirlpool's new steam washer/dryer upstairs, top Consumer reports Kenmore downstairs). The house has safety features: security & fire-monitored system, smoke alarms in every bedroom, fire extinguishers upstairs & down. If you have a medical emergency, there is a medical alert button on the alarm system - push it for an ambulance. There is also a police & a fire button. The Heating & Air conditioning has 4 separate climate controls, there are 3 hot water systems, & 9 fans, There is a laundry on each level. We stock easily forgotten items for your convenience, cleaning crew leaves all paper products, cleaning products, unopened pop/soda & alcohol left by previous guest, to save you money. The electronics have been upgraded to all large flat screen TVs (7 of them) & DVD (9) players. Every bedroom, the family room & the kitchen have plasmas. There is DVR service, high-end cable, a work desk with a wireless printer with scan & fax capability, & a shredder. The house is newly equipped with a cell phone booster antenna so unlike most ocean front homes, this one gets good cell service. Lots of Parking: parks 7-10 cars comfortably, 4 of them under the house where there is also lockable storage for your bikes & beach equipment. There is a wood-burning fireplace…this is a dream get away – I even provide a welcome bottle of champagne. The Landscaping is premier: planned for color year round, & scent in every season. We've worked to make this a 'quiet' house, with noise control bumpers everywhere, heavy sound insulation in new addition, new sound bar to reduce TV noise transfer to bedrooms, new comfort height quiet close toilets in all bathrooms but one (to accommodate small children. 2013 rates are extremely competitive on a per person per night basis for an oceanfront home – far cheaper than SeaPines or Palmetto & in a fun & and convenient neighborhood. Beds: 5 king, 3 queen, 6 twin, 1 trundle. It will sleep 23 in premium beds. Hilton Head Island is the ideal vacation spot - superb beaches, marvelous infrastructure, great golf, boating, fishing, kayaking...more to do than you can believe and some of the best restaurants you can imagine. Hilton Head is 1 of the top 10 beaches in the US, is the most environmentally sound island (no bright street lights, large signs or garish buildings: heavily treed) 250 restaurants, 50 miles of bike/nature trails & loggerhead turtle nests on the beach, botanical gardens, eco tourism opportunities for extensive viewing of wildlife at multiple preservation areas, Designer golf (24 courses on a 12 x 5 mile island), antiquing, birding, fishing, shopping and shelling with beautiful weather, family friendly atmosphere & natural beauty that has been carefully preserved. 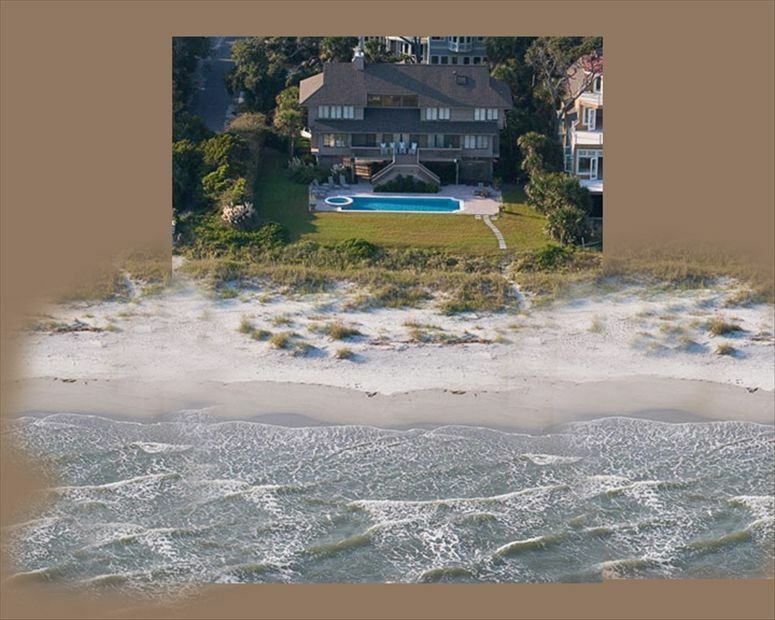 This house sits right on the beach - the view is a never ending panorama of people, dolphins, birds, dogs, sun, kites, pelicans - see the video in our website to get an idea of what heaven on the beach looks like. Dolphins & pelicans are common sights & the beaches are maintained in exquisite condition. There is surfing, sailing, kayaking,, para gliding/flying/surfing - any water sport you could want. More excursion opportunities than you will want to take to other islands, old plantations, to Savannah (Top 10 most beautiful US cities) & Charleston are nearby. This is an perfect get away to either totally relax or enjoy some historical tours. There is a prolific Art & Culture center, multiple world class spas. There is beach biking (and beach wheel chair rental). There are lighthouses, museums, fireworks and concerts. Come revel! 4 Air conditioning zones for personal choice on temperature, 9 fans to optimize comfort. Hunter Douglas wood shades in all rooms. AC units out of sight and sound on a secluded deck. Premium bath towels, sheets, bath mat per guest provided. Starter sets of soaps/shamoos/conditioners and kitchen supplies provided. 'Oops' drawer full of easily forgotten items for guest use. (2) Two laundries: Consumer reports top rated washer and dryer on main floor (Kenmore). 2nd Floor Laundry has latest Whirlpool steam technology washer and dryer & a large linen closet. Three separate hot water systems one of which is an 'instant hot' no tank system to provide endless hot water. Premium towels and linens provided to each guest. Gave up on a Keurig - guests just don't want to buy distilled water to use in it and the local water destroys them in a matter of weeks - sorry. muffin pans, cake pans, graters, turkey pan etc. I lived hear half the year for the last 5 years so the kitchen is outfitted for someone who cooks a lot. Large elevated (18' above sea level) deck with cable fence for an unimpeded view (lockable gate to stairs). View of the ocean from deck is extraordinary with dolphins visible daily. Bring a hammock - hooks are provided for two. Large brick patio surrounds pool with table/chairs, loungers etc. The SeaScape living room is next to the pool and has couches/chairs/lights/fans and shade for those who want it. There is a bar and a pop frig as well. Huge pool (17' by 44') option to Heat. With this pool, you won't need to golf or play tennis, though both are nearby. Pool has ‘Virginia Graham Baker Act’ approved drains which few private pools have put in as they are not mandated. Pool toys available in lockable storage area near pool. Lots of patio furniture, lanais. 8 rocking chairs on elevated deck. DVR, 52' LG Flat screen in Living Room, 46' Flat Screen in Master 1, 46' Plasma in Master 2, Plasma in Kitchen, 42' Flat Screen in double Queen Guest, Security System, Fire monitoring, Color printer/fax/copier, gated porch/balcony in back, large sunny pool with deck, recently remodled, large bar, dining table for 10, bar seats 6, breakfast nook seats 4, heart of pine floors, granite counter tops, Thermidor gas stove, comfort height bathroom counters, Saturia baths, 96 feet of Oceanfront. Work table with printer/scanner, shredder. 1 hour of free tennis available at Van Der Meer tennis club. Book library of over 75 books, some talking books available for guests. Lockable storage on drive in level for golf clubs and bikes. mini frig in master bedroom. New additions in 2011 include a bar in the pool area, a pop frig near the bar, a double wide charcoal grill. New landscaping, and best of all, new hurricane windows for greatly enhanced cooling, noise control and views. SO nice to have great renters who appreciate the work we put in during our annual maintenance program to make this and my other homes on Hilton Head as nice as they can be. As a dog friendly home (Sept to May) we clean the carpets after each pet guest like Tony and Jane's cutie, and have a rigorous maintenance plan. We also have the largest private pool on Hilton Head, and as a safety conscious owner have an alarm, fire extinguishers and carbon monoxide detector. Thanks again Tony and Jane for being such wonderful guests! A Thanksgiving Week To Remember! We have a large family and I wanted to find a home on the ocean that all of my family and friends could enjoy, including my mom who is 91. 33 Sandpiper was beautiful, from the living space to the bedrooms. Oh, and lets not forget the wonderful deck overlooking the Ocean and the heated pool. This home also offers a wonderful fenced area for a dog, which my golendoodle enjoyed. Best Vacation home ever!!!!!!!!!!!! Beautiful home. Amazing view. Everything provided to make an absolutely perfect vacation! Kathleen and Destination Vacations went above and beyond to ensure our wedding and stay for the week were memorable, which it was. The house was exactly as advertised and the views/pics were fantastic. The elevator was especially helpful for our elderly parents and loading/unloading. We would absolutely rent this house again the next time we visit HHI. Incredible Home on the Beach! This house is absolutely incredible! It has so much space, and the view was breathtaking! We had a WONDERFUL vacation here with our family and friends! I highly recommend this house. We've stayed in several Hilton Head homes but NONE better than this one. Everything in this house is first class. The views are unreal. The beach is gorgeous without the typical resort traffic. Our big family was able spread out and have privacy in the home when we wanted and then there was more then enough room for all of us to hang out and eat together. HUGE house. You won't find a better one. If you like to eat out, we have more options than you can begin to try in a week. From high end gourmet (Robert Irvine's 'Eat' geing a great experience) to the best (very best) burrito you will ever eat (at Amigo's - a strip mall dive with the best marguerite in town). Like history? from thousands year old shark's teeth to be found on the beach to the Civil War cannon ball we found while planting, this is a fascinating place. Ever see a Revolutionary War soldiers grave? They're here. Prefer water sports? There is not much you can't do here. Like to kayak with dolphins? go oyster picking? wind surfing? Para flying? Ziplining?